Rewrite the rules of injection molding with 3D Systems thermoplastic additive manufacturing printers and materials. 3D Systems offers a wide variety of 3D printable thermoplastics, engineered for a range of applications. Materials specialists, designers, and manufacturing engineers can collaborate on getting the exact features they need for both aesthetics and function. These new design and manufacturing options open the door to improved products, new designs, new business models, and new markets. 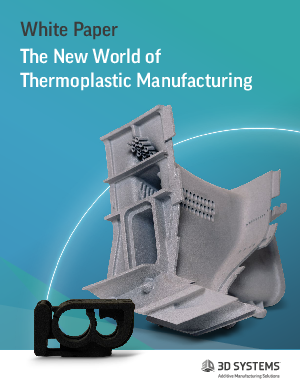 The key is to know when to use thermoplastic additive manufacturing instead of conventional injection molding. To read more about how 3D Systems can help your business download this whitepaper today.